Unable to see the EV Toolbar in the Outlook after the Mailbox moved within Exchange Database Findings & Cause: -Found Event ID 3357 This mailbox cannot be processed until the Exchange provisioning task has processed the corresponding user’s details. Ensure that a provisioning group includes this user and run the provisioning task. To disable these warnings, set the ‘HideMissingPolicyInfoErrors’ registry value to 1. Run the EVPM tool in the command prompt. – Enabled Mailbox to be provisioned for Archiving. -Restarted Outlook, Sync button appears now. Operation failed, diagnostics report: iScsi Adapter in unbound status, adding Static Target can not be done. You might see error in VMWare ESXi when LUN is created in EMC VNX3150 and you grant access to hosts that added to the VNXe3150. 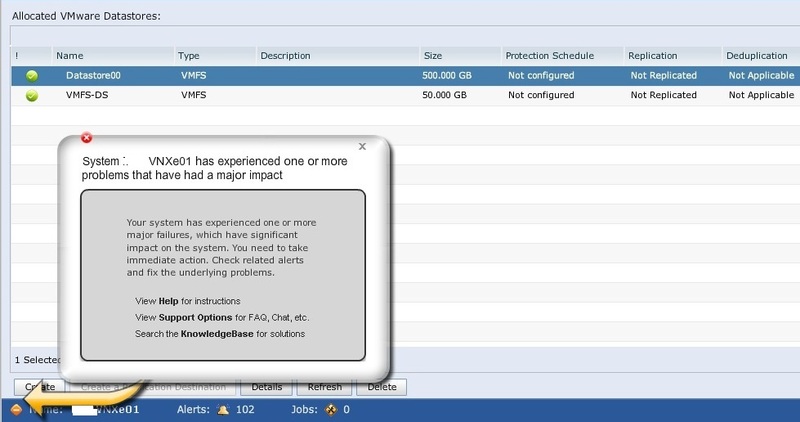 This error is generated because EMC VNXe3150 try’s to add the iSCSI Servers/Targets that configured in the EMC VNX to each ESX that granted access to the LUNs. While the iSCSI Targets already added in the Dynamic/Static iSCSI Targets tab, this error is generated. I think EMC should introduce some logic into the EMC VNXe3150 SAN Storage to initially check the Host if the iSCSI Targets already added, adding iSCSI targets via EMC should be ignored. Or, VNXe3150 should loop through the storage pools/LUNs where it finds LUNs already presented to ESX hosts from the same Array, adding iSCSI Targets through EMC VNXe3150 should be ignored. Otherwise this fake error will keep presenting itself. Setting up & Configuring EMC VNXe3150 iSCSI SAN Storage with High. Finally, the EMC VNXe3150 got installed and configured and almost ready to start transition from old EMC AX4 to the new VNXe3150. In the initial stage, found a bit difficulties to get it configured correctly as every EMC documentation speaks about something else specially when it comes to iSCSI High Availability, they mix between NFS HA and iSCSI HA. In reality, both Storage HA of NFS and iSCSI differ from each other. Simply, NFS uses Link Aggregations with LAG/LACP and iSCSI is not. Two Dell Stackable 6224 – 24 port Gigabit switches configured with Jumbo frames for iSCSI and Flow Control Enabled. Each of the Gigs port in ESXi host is connected to the Physical iSCSI Switches. Two VMKernel PortGroups created in vSwitch1. Each of the iSCSI Kernels is mapped to the physical interface in ESXi. 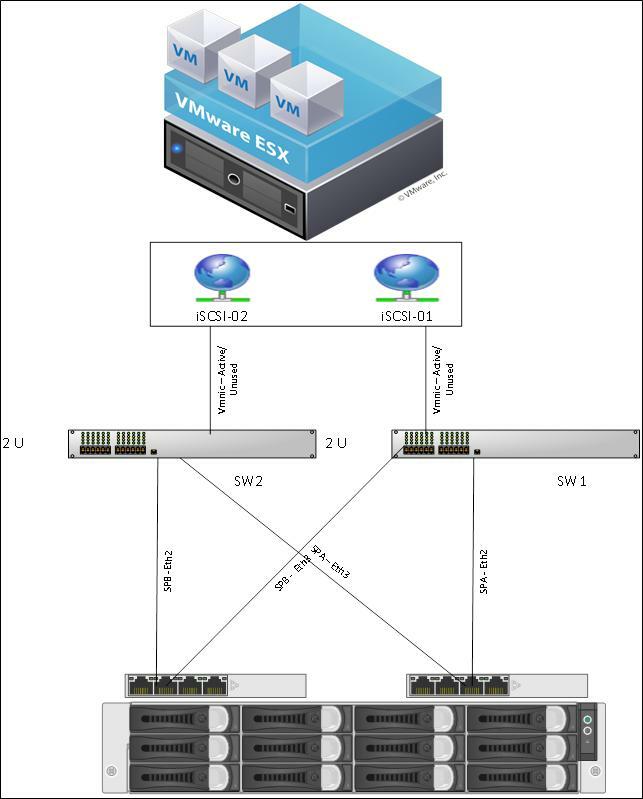 To check the connectivity is mapped correctly for each iSCSI PortGroup to reach the correct Ethernet Interface in the Storage Processor; vmkping with –I will allow you to specify the source interface to reach the destination iSCSI target; as this will test the whole path end-to-end from VNXe Storage, ESXi Hosts to Physical iSCSI Switches to make sure connectivity can flow with jumbo frame. 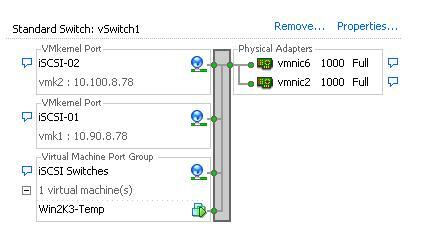 Both iSCSI VMKernel portgroups has to be enabled for port bindings in the iSCSI Initiator adapter of ESXi. Setup the ESXi hosts to access VNXe iSCSI SAN Storage. This can be done by browsing into the VNXe > Hosts > VMWare will allow you to find ESX hosts either by typing in the IP Address of the vCenter or the management network of the ESXi itself. Then create VMFS datastore on the VNXe and make sure you are assigning permission to the ESXi host to access the newly created LUN. After the LUN is presented to the ESXi host and formatted with VMFS now it’s time to change the path selection through from default Fixed to Round Robin and change the Round Robin default IOPS limit in ESXi from 1000 to 1 which will allow you to utilize all the iSCSI paths. Once it’s change you will see all the paths with Active(I/O) for each LUN that changed from Fixed to Round Robin. Exchange Server 2010 with all the Roles. The second Virtual Machines are a Windows 7 Professional client with Microsoft Outlook 2010 connected to the Exchange 2010 MAPI profile. Sending and receive emails internally is operational in normal mode. I have tested failover with network issues scenarios by disconnecting one pNic “vmnic2” from the vSwitch1 that mapped to iSCSI-01 portgroup and at the same time vmkping –I vmk1 was running against both VNXe iSCSI Target IP’s SPA-Eth1 “10.90.8.1” & SPB-Eth2 “10.90.8.2” and ping continues well. If a Storage Processor (SPA) fails/rebooted on VNXe, the working Storage Processor (SPB) picked up the workload that was handled by SPA. 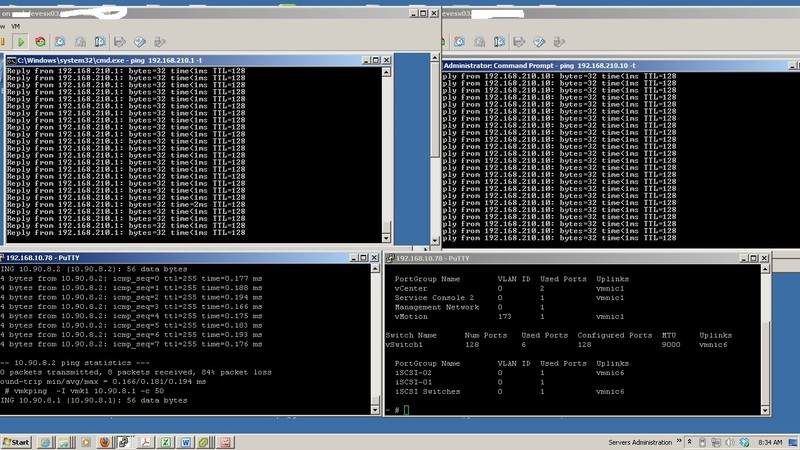 As you can see in the above screen shots, Virtual Machines Windows 7 Client continued pinging the Exchange Server and Exchange Server continued to ping Windows 7 Client. Vmk1 = iSCSI-01 which mapped to vmnic2 stopped pinging to the SPA-Eth2 & SPB-Eth2. LUN Paths both links mapped to vmnic2 subnet 10.90.8.x dead and 10.100.8.x paths mapped to vmnic6 ‘vmk2’ “iSCSI-02” are live and Active(I/O). The second test was done by removing the physical power from Storage Processor-B and initiate vmkping to both Ethernet Interface of SPB from both VMKernel vmk1 & vmk2, as a result vmkping continues as the traffic routed peer SP port. Below result shows that Exchange VM continues to ping the Client VM during Storage Processor-B shutdown. Did the same with Storage Processor-A and initiated ping to both Ethernet Interfaces of SPA. Ping continues to both Ethernet Interfaces as well as pings inside each VM “Exchange Server to Client” and vice versa continues as well and Exchange Server VM didn’t give any freeze / errors in event viewer. The VNXe3150 high availability feature at storage level and networking level ensures data protection against any single component failure in Storage Level and Networking Level.